Crinoids, commonly referred to as sea lilies, are ocean dwelling creatures that live their lives attached to the sea floor. They are composed of three main body parts: the arms that filter food particles out of the water, the head (or calyx) which houses the internal organs and mouth parts, and the stem which attaches to the sea floor by a root system called a hold fast. 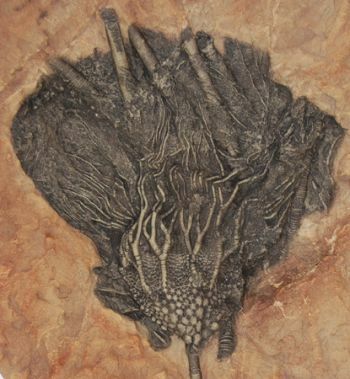 Crinoids are animals in spite of their plant-like appearance. They are members of a phylum of sea creatures known as Echinodermata, which means "spiny skin." Other examples of non-extinct echinoderms include sea urchins, sand dollars, sea cucumbers, and starfish. Syphocrinites elegans is from the Devonian, 395-360 million years ago. The Devonian is known as "The Age of Fishes." Crinoids became more widespread during the Mississippian Age, approximately 347-325 million years ago. The Mississippian Age is when crinoids reached their peak, carpeting the floors of the shallow seas. The Mississippian Age has been called "The Age of Crinoids." 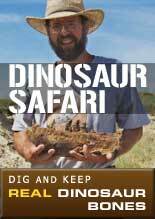 The fossil record includes about 2100 species of crinoids and 800 species survive today. Modern day crinoids live at great depths in the ocean. Because crinoids disarticulate easily when they die, we usually only find parts of them (usually stems). 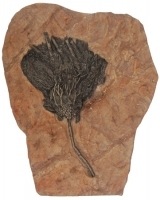 Complete crinoids are a rare and treasured find. This specimen of Syphocrinites elegans is nicely contrasted in black against the red colored matrix. Time: Devonian, approximately 395-360 million years ago. 14-3/8" x 11" x 1-1/4"